There was unusually high number of babies who arrived unexpectedly in May, so I made this is a two-parter. Links to full stories and photos. Megan and Bryant Platt, from the country town of Gin Gin in Queensland, were on their way to hospital in May when their son Liam was born by the side of the road, under a street light in the tiny town of Sharon on the outskirts of Bundaberg. He was delivered by his dad with the help of a Triple 0 operator; Bryant described it as a “scary” and “slippery” situation. Liam has a big sister named Amelia, aged 5. Chantal Burrows, from Shepparton in Victoria, had practised hypnobirthing in preparation for her labour, and decided to relax and go with the flow no matter what happened. She listened to music, took a little walk, then had a bath to help things along. Her tradie husband Grant was also relaxing, by watching the footy on TV. However, he became slightly less relaxed when he realised that he was going to have to deliver the baby himself in the bath. Chantal stuck to her birth plan by not getting stressed and trusting her husband completely. Their new baby boy is named Nash, and he has a big brother named Jasper, aged 2. Sue Hopkins from Geelong in Victoria was better prepared than most as she headed off to hospital – she had her birthing partner Kellie Whiskin with her, and was being driven by her husband Rob, who is a doctor. When it became apparent they weren’t going to make it in time, her team sprung into action and placed Sue by the side of the road, where she gave birth lying amongst the gravel. Baby Carrie was born into her father’s arms, although Rob hadn’t delivered a baby since his medical school days. A passing handyman named Gary Boyd also helped out. Carrie has a big brother named William, aged 2. Karissa Marich from Port Augusta in South Australia gave birth to her son Izaiah Marich-Warren by the side of the road, with assistance from her mum, Karina Welsh. Simone and Will Buckle from Warrnambool in Victoria welcomed their daughter Saige Violet just six minutes after Simone first felt a mild contraction. The couple soon realised they couldn’t wait for an ambulance when Simone felt the baby crowning while she was in the shower. Will, a carpenter, says it was “nerve-wracking”, but there was literally no time to worry as he covered the bathroom floor in blankets and towels and delivered his daughter. Saige has a big brother Angus, aged 2, who was born after just 40 minutes labour. Simone does not want another home birth, although Will can see the benefits and is prepared to do it again if necessary. Felicity and Michael Weeks from Toowoomba in Queensland were on their way to hospital when their daughter Tia was born in the back of the car, delivered by her father with the help of a Triple 0 operator. Umi Dowell from Brisbane felt contractions the day she gave birth, but didn’t worry about it as she’d been feeling them for more than a month. She saw her husband Mark off to work, and attended a check-up with her doctor, who said she wouldn’t need to come in for another week. Umi was eating lunch at home when she went into labour. She didn’t think of calling for an ambulance, as that seemed “a little bit too dramatic”. At the last minute, she did phone Triple 0, and was told to begin preparing for the baby’s birth. Umi panicked as she realised she might have to deliver her own baby, but paramedics Nick Bleckmann and Benjamin Gray did make it just in time, assisted by student paramedic Aynslee Ryan. Umi’s neighbour Louise also came over to help. Baby Josh was born on the kitchen floor after a 15 minute labour. Josh has a big brother named Ethan. Kirrily and Tim Anderson-Bonsar of Melbourne were warned that they might have a difficult birth with their second baby, because their eldest child, Acacia, born two and a half years previously, had needed a caesarean delivery. 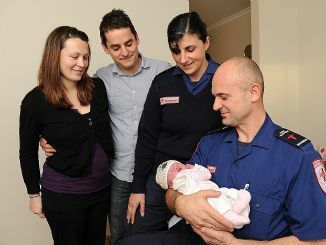 When Tim urgently phoned for an ambulance for his wife late one night, paramedics Steve Mati and Michela Clarke squeezed into the couple’s tiny partly-renovated ensuite bathroom to deliver the baby. Steve said there were a few tense moments, but Meadow Akiko arrived in just 16 minutes. Meadow’s middle name Akiko is a common Japanese name which can mean, aptly enough, “autumn child”. Anyone else finding Acacia and Meadow a rather delightful sibset? [Photo of Meadow with her parents and the paramedics]. Nick O’Malley is the US correspondent for the Sydney Morning Herald, and last week he got to contribute a personal story in the Opinion column about the recent birth of his second child. His wife Kathleen woke in the night with mild contractions, and phoned the Royal Prince Alfred Hospital in Melbourne for advice. They told her not to come in until her waters broke, to take two Panadol and try to get some sleep. A couple of hours later, Kathleen’s waters did break, and Nick bundled his now bellowing wife into the back of the car. During the drive to the hospital, Kathleen gave birth to their son, Clyde Johnston O’Malley. Newspaper articles about babies born in cars tend to be coy about the details, but Nick gives a blow-by-blow description, including all the swearing, screaming, biting, traffic violations, and having to spend $150 to get the blood cleaned off the car (he paid $30 less than usual because it was from a baby being born). The man who cleaned the car was named Sam. I could totally get behind Kirrily, I think. I think Kirrily is an Aussie name that would travel well internationally. Definitely. It reminds me of the Manx name Kirree. A second cousin of mine has daughters called Kelsey and Kyria (ki-ree-uh) — Kirrily would fit nicely in between.